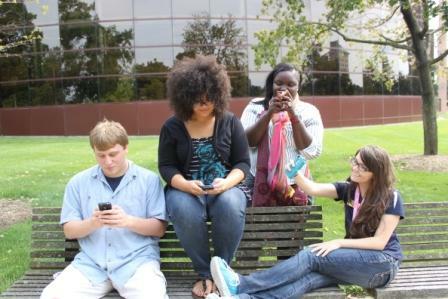 Students@UM-Flint, a new student blogging and social media initiative, launched officially on Tuesday, August 14, 2012. An introductory post from student Erika Trigg (who happened to be celebrating a birthday) was posted on Facebook and achieved 120 pageviews that day. Students@UM-Flint is a team of current University of Michigan-Flint students on a mission to connect with you. The stories you’ll find here belong to these students. We hope that you’ll follow them through the academic year, connect with them on Twitter, and ask them questions about the university. You’ll find that life at UM-Flint truly is yours to create. The story is yours to tell. Our goal for the Students@UM-Flint project is to connect prospective and current UM-Flint students, and ultimately drive applications for admission to the university. We can’t currently determine who is visiting the blog (i.e. current versus prospective student, parent, staff member, etc. ), but we are able to see what traffic the blog has achieved so far, and how many people left the blog to visit the Undergraduate Admissions website. Below, a summary of promotion efforts in the first six weeks of the blog site’s operation. In total, the blog received 1,162 visits from 843 unique visitors. Old-fashioned posters were also posted around campus on August 22. An RSS feed from the blog was included in website landing pages for Future Students and Current Students, however no traffic seems to have come from these locations. What’s working: Traffic from Facebook has been the most steady. In the future, a Students@UM-Flint cover photo will be posted as a reminder about the site. The slider image on the university home page was also effective. Working this graphic back into the slider rotation (it isn’t currently posted) may help boost traffic down the road. What we need to work on: There is currently very little traffic from the Students@UM-Flint blog to the Undergraduate Admissions website. In fact, only six referrals to the website have come from the blog so far. Is there a way to make the push more effective? Can the links be better highlighted? Overall, while there’s room for improvement, I’m quite pleased with the audience the Students@UM-Flint have reached. Focusing on consistent content and growing students’ Twitter followings is next on the agenda, as well as evaluating the structure of the program.